Each generation faces its own set of challenges. When it comes to home-buying, millennials are finding it difficult to reach their homeownership goal, which for many is a huge step in achieving the American Dream. High student loan debt is just one obstacle standing in the way, keeping millennials from saving enough money for a down payment—and the longer they wait, the more they fall behind with rising interest rates and home prices. But, with all the focus on homeownership, those who sign a lease every year tend to forget that they're spending a ton of cash on renting. Millennials are spending the most, according to a recent report by RentCafé, which analyzed each generation's total income and rent paid during an eight-year period—from 22 to 29 years of age—using Census data for single people paying the average monthly rent on their own. The findings? Millennials spend a whopping $92,600 on rent before they're even 30. Gen Xers spent $82,200 and baby boomers paid just $71,000. However, millennials may not be on top for long. Gen Z renters will spend an estimated $102,000 within that same age range, according to the report. Of course, rising income plays a role too, having increased from a median of $195,700 for baby boomers to $202,100 for Generation X individuals and $206,600 for millennials aged 22 to 30. 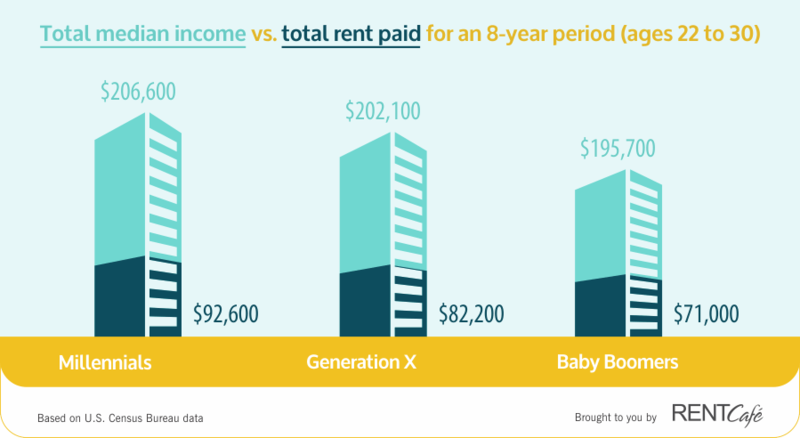 However, the small increase of $4,500 between median income for Generation Xers and millennials doesn't make up for the $10,400 increase in rent paid between the two generations. There are also differences in spending within each generation. According to the report, younger millennials between 22 and 29 years of age have paid more in rent than those aged 30 to 40. Regardless of earning a higher income than older millennials, the younger segment paid $6,900 more in rent. According to the report, the recession and social factors are to blame for longer rental periods. With so many funds going to rent, compounded with market challenges and high student loan debt, millennials are struggling to save for homeownership. Will future generations decide to stay at home with their parents longer to save on rent and achieve their homeownership dream?